Recently, the media has been up in arms about this new Hitler doll being sold in Kiev. 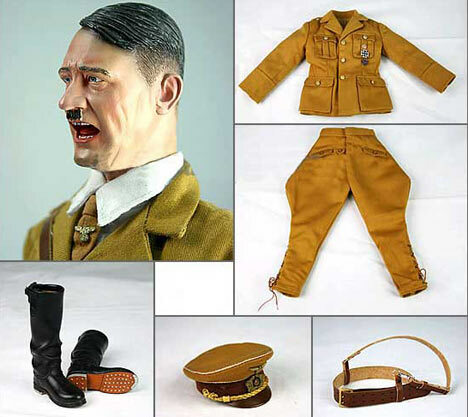 It's not a new concept, as Hitler action figures have been around for some time now. While they tend not to show up at Toys R Us, they aren't meant for children in the first place. So, for $200, anyone can have a 12" dictator. The source information upon which this article is based is false, anti-Ukrainian propaganda. There is detailed information about how this story came to be twisted into a slander against Ukraine, one posted by the Kharkiv Human Rights Protection Group (http://www.khpg.org/en/index.php?id=1209570049) and a more detailed analysis by the Ukrainian Archive (http://www.ukar.ca/shevchenko/buzyna/hitler.html).